What Is Conglomerate? How Does It Form? What Is It Used For? 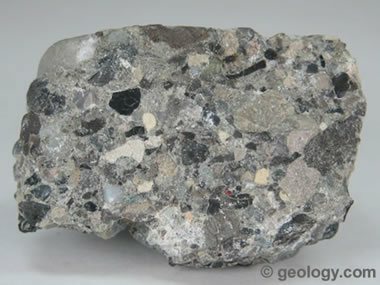 Conglomerate: The specimen shown is about two inches (five centimeters) across. It is made up of chert and limestone clasts bound in a matrix of sand and clay. Conglomerate is a clastic sedimentary rock that contains large (greater than two millimeters in diameter) rounded clasts. The space between the clasts is generally filled with smaller particles and/or a calcite or quartz cement that binds the rock together. Conglomerate Close-Up: A detailed view of conglomerate showing the pebble-size clasts with sand and smaller size particles filling the spaces between them. 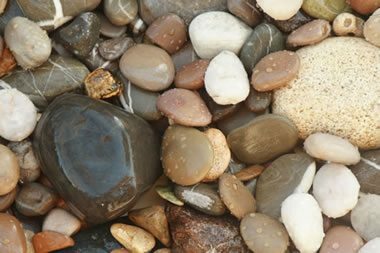 The largest pebbles in this view are about ten millimeters across. Image by the United States Geological Survey. What is the Composition of Conglomerate? 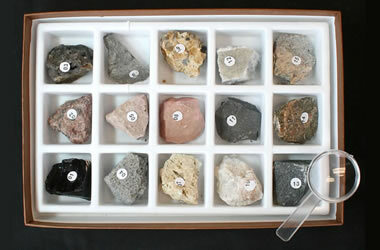 Conglomerate can have a variety of compositions. As a clastic sedimentary rock, it can contain clasts of any rock material or weathering product that is washed downstream or down current. The rounded clasts of conglomerate can be mineral particles such as quartz or feldspar, or they can be sedimentary, metamorphic, or igneous rock fragments. Clasts of quartzite, sandstone, limestone, granite, basalt, and gneiss are especially common. The matrix that binds the large clasts together can be a mixture of sand, mud, and chemical cement. 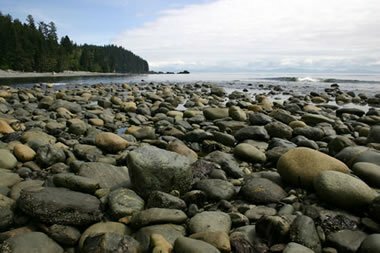 Conglomerate-Forming Environment: A beach where strong waves have deposited rounded, cobble-size rocks. If buried and lithified, these materials might be transformed into a conglomerate. Image copyright iStockphoto / Jason van der Valk. Conglomerate-Size Sediment Clasts: Pebble-size clasts of many compositions deposited together on a beach. Quartz, sandstone, and limestone clasts are all easily recognizable. 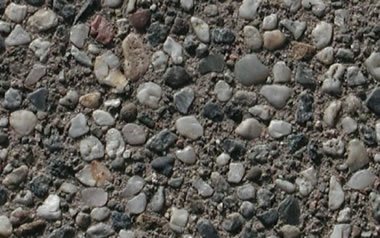 Largest clast is about two inches (five centimeters) across. Image copyright iStockphoto / Ivan Ivanov. Conglomerate forms where sediments of rounded clasts at least two millimeters in diameter accumulate. It takes a strong water current to transport and produce a rounded shape on particles this large. So the environment of deposition might be along a swiftly flowing stream or a beach with strong waves. These conditions might only be met during times of extreme flow or wave action. However, it is during these times that much of the Earth's sediments are moved and deposited. To form a conglomerate, there must also be a source of large-size sediment particles somewhere up current. The rounded shape of the clasts reveals that they were tumbled for some distance by running water or moving waves. These conditions are found in streams and standing water bodies in many parts of the Earth. Conglomerates often begin when a sediment consisting mainly of pebble- and cobble-size clasts is being deposited. The finer-size sand and clay, which fill the spaces between the larger clasts, is often deposited later on top of the large clasts and then sifts down between them to fill the interstitial spaces. After compaction, the deposition of a chemical cement then binds the sediment into a rock. 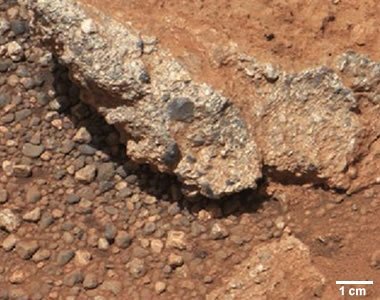 Martian Conglomerate: This image was acquired by NASA's Curiosity rover on the surface of Mars. It shows an outcrop of conglomerate and some pebble-size weathering debris. The round pebbles are too large to have been moved and shaped by wind, thus they had to have been transported a significant distance by water. This photo from September 2012 was the strongest evidence of the existence of water on Mars that had been obtained at that time. 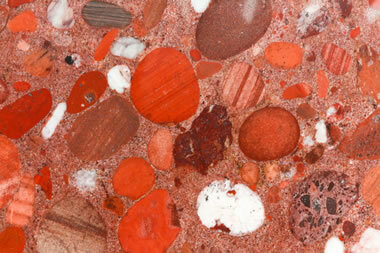 Red Conglomerate: This photograph shows a portion of a dimension stone slab that was cut from a red conglomerate. The conglomerate is composed of well-rounded clasts of quartz and sedimentary rocks of various sizes and kinds along with a fine-grained matrix. To work well as a dimension stone, this conglomerate would have to be bound tightly with a very competent cement. This material would make spectacular wall panels, flooring tiles, stair treads, and other architectural elements. Image copyright iStockphoto / Violetastock. What is Conglomerate Used For? Conglomerate has very few commercial uses. Its inability to break cleanly makes it a poor candidate for dimension stone, and its variable composition makes it a rock of unreliable physical strength and durability. Conglomerate can be crushed to make a fine aggregate that can be used where a low-performance material is suitable. Many conglomerates are colorful and attractive rocks, but they are only rarely used as an ornamental stone for interior use. Analysis of conglomerate can sometimes be used as a prospecting tool. For example, most diamond deposits are hosted in kimberlite. If a conglomerate contains clasts of kimberlite, then the source of that kimberlite must be somewhere upstream. In rare instances, conglomerate can be a "fossil placer deposit" containing gold, diamonds, or other valuable minerals. These conglomerates are mined, crushed, and processed as ores.